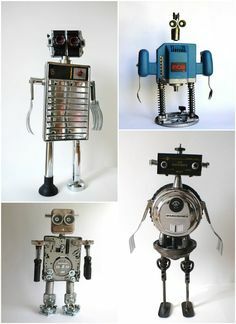 Gille Monte Ruici is a French artist, based in Paris, He builds sculptures, essentially robots, exclusively using recycled scrap metal parts. He finds his materials in trash cans, in the street, or in second hand trades. His approach gives these scraps a second life and repurposes them. He invents and makes unusual constructions. All the assemblies are done with screws or bolts. Metal is ideal, he likes the material, easy to work with particular reflections, differently patinated, which are harmonized easily. Why metal? Because more and more products of our daily life are made of plastic, these assemblages actually use objects from an earlier era that mark our memories, that encourage a slight nostalgia. His approach consists in giving scrap metal parts a second life by diverting them from their original vocation. Each achievement made from what others view as waste is unique. It is important to demonstrate that waste, things destined for the garbage, can be recycled and become unique artistic objects. Often for the robots, he discover a box, a fire extinguisher, a toaster, a vacuum, an electric case…which is going to become the body, and after, he have to find what can make the other parts. Either the final vision is immediate, or the idea of the potential must mature and will emerge later on. And as pieces are unique, he can never reproduce a robot identically. The performance consists in creating, each time with absolutely different materials, different bots. he loves assembling robots for their vintage appearance, and their terrible and invading look. With a little imagination, any element can fit into the assembly. 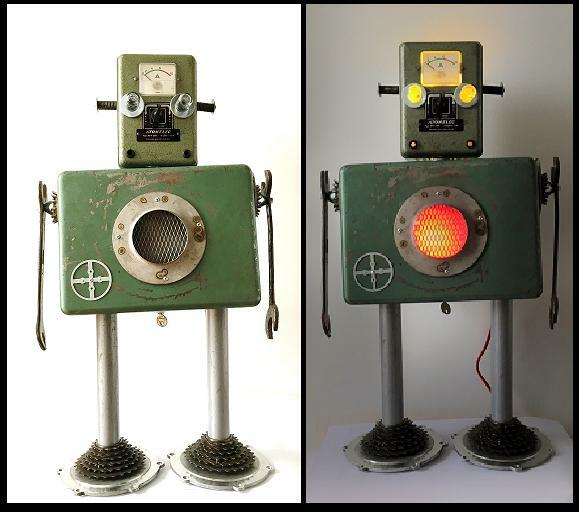 Now he assemble robots with better finishes, sometimes he inserts luminous LEDs.